This one is for the Chrome lovers out there - who, like me - have numerous tabs open at all times. Most of these tabs will fit into categories. We have many demands on our time and having the ability to keep it organized can prove very powerful. I LOVE this tool!!! I honestly use it every single day. As a classroom teacher I would have loved this, too! I'd have put my main 'teacher' links in one collection (email, gradebook, LMS, IPDP, etc) and then have a bunch of collections for each unit of study. Adding to collections is super easy - as is deleting - so each year I can have my favorite resources in one spot. Why Toby over bookmarks? Two reasons and I'm a girl who 💖💗💝 bookmarks! I can open all of the links in a collection with ONE click!!!! Plain and simple. A collection with 3 tabs? No problem. A collection with 10 tabs? STILL no problem! Need to shut down but don't want to lose your current tabs? No problem! Create a collection for this & when you open Chrome again, you can simply click to open all of your tabs once again & pick up where you left off! AMAZING!!!! Have I convinced you yet? Check it out ... don't wait. It will change your (digital) life. 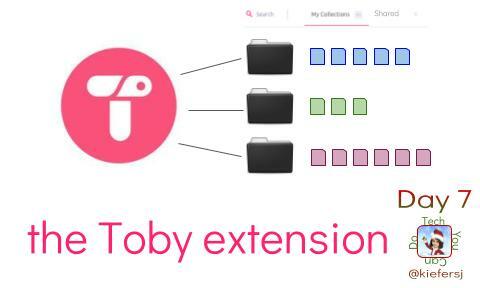 You won't need to keep 8,000 tabs open any more. You can "collect" them in groups and open the group as needed. Promise.